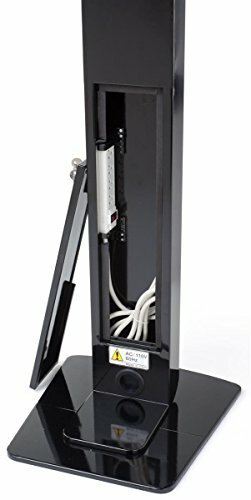 This tablet floor stand is for use with iPad 2-4, iPad Air, and iPad Air 2. 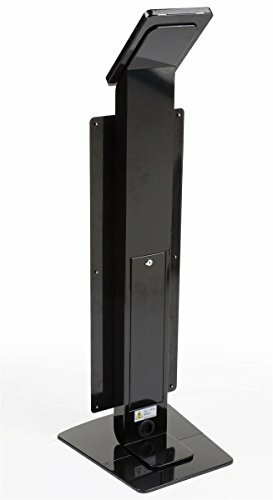 The pedestal kiosk measures 54.25 inches tall and features an angled enclosure that displays the touch-screen device in either portrait or landscape orientation. 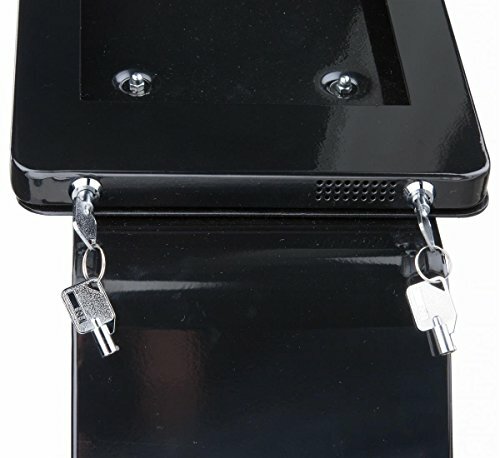 This floor stand for iPad has a locking encasement to keep the expensive computer protected while in use. The enclosure also hides the “Home” button, which prevents users from navigating away from the intended presentation. 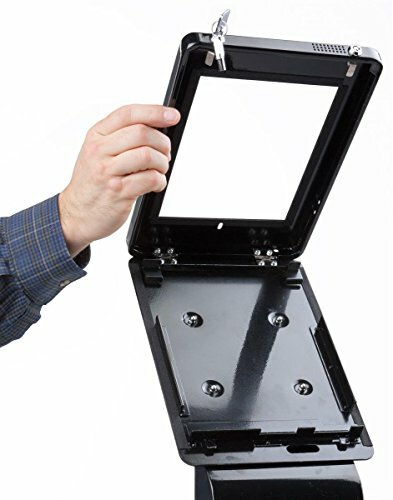 This floor stand for iPad tablets is equipped with an acrylic poster frame for displaying 12.5”w x 36”h graphics. The acrylic panels are held together using (4) silver standoffs screws (1 in each corner). Not only does this create a professional-looking appearance, but it also allows users to present static advertisements underneath the tablet to draw even more attention toward the interactive device. The floor stand for iPad has a hollow column in which a power strip is stored to keep wires free from tangles. The minimizing of wires and cables also creates a more user-friendly and attractive presentation. Dimensions: Overall: 14-1/4"w x 54-1/4"h Tablet Mount: 11-3/4"w x 7/8"h Base: 14-1/4"w x 1/2"h x 14-1/4"d Poster Holder: 12-1/2"w x 36"h x 1/4"d Weight: 42 lbs.